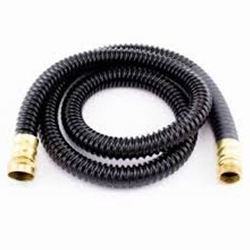 Lightweight 5 ft. hose is highly flexible. Takes weight off the wrist and flexibility allows for effortless maneuverability of the spray gun. An added feature is that the air through the spray gun is not as hot (due to the fact the spray gun is now 5ft further from the turbine). This often alleviates problems with fast drying lacquers drying too quickly.